Washington - The Federal Reserve has left its key policy rate unchanged but signaled that it plans to keep responding to the strong U.S. economy with more interest rate hikes. The next rate hike is expected in December. The Fed left its benchmark rate in a range of 2 percent to 2.25 percent. A statement it issued Thursday after its latest policy meeting portrayed the economy as robust, with healthy job growth, low unemployment, solid consumer spending and inflation near the Fed’s 2 percent target. In deciding how fast or slowly to keep raising rates, the Fed will be monitoring the pace of growth, the job market’s strength and gauges of inflation for clues to how the economy may evolve in the coming months. The brisk pace of economic growth — a 3.5 percent annual rate in the July-September quarter, after a 4.2 percent rate in the previous quarter — has raised the risk that inflation could begin accelerating. Some economists foresee only two Fed rate hikes next year. Others expect that economic growth will remain solid and the job market strong and that the Fed will decide that four rate increases will be justified next year to guard against high inflation. At 3.7 percent, the unemployment rate is already at its lowest level since 1969. Last week, the government reported that the economy added a sizable 250,000 jobs in October and that average pay rose 3.1 percent over the previous 12 months — the sharpest year-over-year gain in nearly a decade. That’s welcome news for workers. But it’s a trend that may raise concern that accelerating wages will help fuel undesirably high inflation. 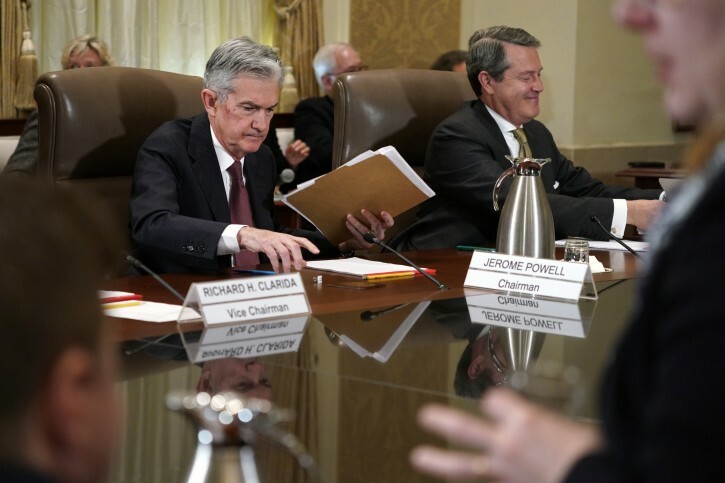 Chairman Jerome Powell has stressed that the Fed is determined to follow a middle-of-the-road approach: Keep gradually nudging up rates to control inflation but avoid tightening too aggressively and perhaps triggering a recession. Even after three increases this year, the Fed’s benchmark rate is still low by historical standards. The central bank’s policymakers have stressed, and most economists agree, that these small quarter-point increases amount to a gradual pace of credit tightening. Still, the Fed’s benchmark rate affects many consumer and business loans, including mortgages and credit cards, and when it raises it, borrowing can become more expensive for many. Savers, though, typically earn more on their cash deposits as interest rates rise. Since the stock market started tumbling last month, President Donald Trump has attacked the Fed’s rate hikes as well as Powell’s leadership. Trump’s public criticism has aroused concern that he is intruding on the central bank’s long-respected political independence and its need to operate free of outside pressure. At the same time, the nervousness among stock investors reflects the reality that the Fed’s steady march toward higher rates is removing a key factor that has underpinned the bull market in stocks: The richer returns that investors could achieve in stocks than in bonds or savings accounts. Powell, who was Trump’s hand-picked choice to lead the Fed, has avoided responding directly. The chairman has instead expressed determination to pursue the Fed’s mandate of maximizing employment and stabilizing prices without regard to political considerations. The Fed is edging closer to what it sees as the “neutral” level. This is the point at which the Fed’s key rate is thought to neither stimulate the economy nor restrain it. The median assessment of Fed officials has pegged the neutral rate at 3 percent. One more rate increase this year and two more in 2019 would leave the Fed’s benchmark rate at a range of 2.75 percent to 3 percent.